Captain Britain, physics genius. | The Captain Britain fans' page and blog. The Marvel universe is full of heroes who are also geniuses and are always happy to defeat villains with a punch and a slide rule, these brain boxes come in all shapes and sizes from family man Reed Richards aka Mr Fantastic to Jekyll and Hyde scientist Bruce Banner. Now when it comes to compiling a list of these heroes I have often overlooked the fact that Captain Britain should be counted among their ranks but my thoughts were derailed onto proving this point only recently. The idea of just how intelligent Captain Britain is started when I was browsing my collection of Captain Britain cards for ideas for this post, tucked away in a folder I came across this card of the good Cap from the now defunct Marvel Overpower card game. 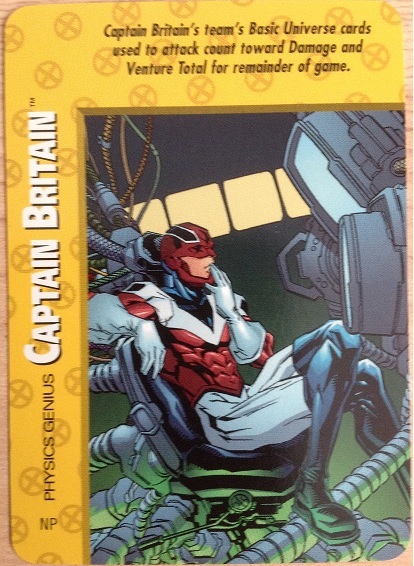 Look at the card’s subtitle ” physics genius, ” and look at the art of a pondering Captain Britain either about to solve some computing conundrum or patching the latest MMO. This card got me thinking was this a case of yet again Marvel misinterpreting Captain Britain or does he deserve that title ? Now when we first see Cap in issue 1 of his comic we learn he has a job that can only be filled by someone with brain power as he is assistant to Dr Travis at the Darkmoor research center. 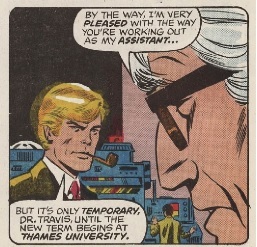 Here he is at work and breaching all sorts of health and safety regulations smoking his pipe, notice the dialogue which shows Cap also has another job requiring him to use his noggin, that of a physics lecturer at Thames University. Further evidence to my idea of a brainiac Captain Britain comes from the fact that Brian Braddock comes from intelligent stock, his parents built a giant computer under their ancestral seat known as Braddock manor. Sadly in a HAL like moment the computer had to be destroyed when it gained sentience and went mad but Captain Britain is clever enough to rebuild the machine and reprogram it to help him. 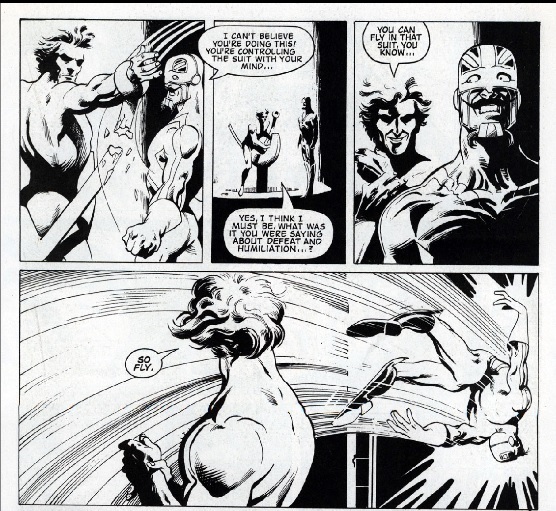 Captain Britain in the eighties also often used to use his wits to defeat his enemies, here is a fine example below where you can see when the villainous Slaymaster attempts to steal Captain Britain’s costume how Cap defeats him by just using his mind. Things took a turn for the worse when Captain Britain joined Excalibur and the examples of him being dumbed down in the series earlier issues could fill a blog by themselves, what isn’t often remembered is that during his tenure on the team Cap built their private jet ” The Midnight Runner, ” a plane that has AI, hypersonic speeds, a cloak and many more technologically advanced features. Sadly despite all my examples Captain Britain’s intellect rarely gets a look in during his adventures, even in his wikipedia article Cap’s qualifications get a one line afterthought but everywhere you look like this old page from the Marvel RPG he is shown to be a genius. As a quick aside the above page also lists a new Captain Britain ability in that he is also an expert on British folklore, which I confess is something I had never thought of him being an expert on but its just so logical. So its obvious at some point Cap was going to have an intellect to match his strength but it never seemed to materialize and he was often portrayed as an over strong buffoon. Luckily Cap’s buffoonery was eventually written out when it was explained he was cursed by a “blunder factor, ” to try and explain away his poor performance as a super hero and why he needed to form Excalibur. However the departure of the ” blunder factor, ” never really corresponded to an more intelligent portrayal of the Captain Britain until Paul Cornell launched Captain Britain and MI-13. So there you have it Captain Britain is indeed as the card said a ” physics genius, ” and he really does have an intellect to match his raw power. Sadly Cap’s IQ seems to fluctuate dependent on his writer but I like to think he could show all the other Marvel egg heads a thing or two and that he can probably complete the Times crossword in record speed as well.. This entry was posted in Merchandise, Opinion and tagged Captain Britain overpower game, physics genius by Richard. Bookmark the permalink. Very well put. To often this quality of Brian Braddocks has been overlooked. It seems the amazing professional superhero and well rounded character I grew up reading (and to whom Marvel owe a debt of gratitude to for my continued readership) has been replaced with a regularly ignored seldom used stereotype. Rick Remenders portrayal in his recent Secret Avengers series almost made me give up on Marvel completely due to the shocking treatment Captain Britain was given. Pingback: Captain Britain visits New York and doesn’t have a nice day. | The Captain Britain Blog. Numbers are the Supreme Court of science. However Godel proved that we may not prove everything. Science needs numbers. There must be Science and Physics Foibles!! Pingback: The Captain Britain blog celebrates its 50th post with some fun facts. | The Captain Britain Blog. Pingback: The bizzare world of early Captain Britain trading cards. | The Captain Britain Blog. Pingback: Was Seventies Captain Britain meant to be the UK version of Spider-Man? | The Captain Britain Blog.